North Carolina's right-to-work law, ratified on 18 Mar. 1947, greatly limits the power of labor unions in the state. The statute makes illegal the closed shop, by which union membership is a condition of being hired as well as of continued employment. The union shop, whereby union membership is made a condition of employment but in which the employer may hire nonunion workers provided they become members within a stated period, is also illegal. Finally, the law prohibits the mandatory collection of union dues by employers through deduction from workers' wages. Section 14(b) of the Labor-Management Relations Act of 1947, popularly known as the Taft-Hartley Act, passed by Congress on 23 June 1947, provided that if a state law was more restrictive on union membership than the federal law, the state law prevailed. Labor organizations at both state and national levels promptly denounced right-to-work laws as disguised union busting and sought repeal of both section 14(b) of the Taft-Hartley Act and all state legislation based on it. Unions declared that North Carolina agencies were using the state's anti-union climate as a selling point to recruit industry. The AFL-CIO's confrontation in 1958 with the National Right-to-Work Committee's efforts to extend right-to-work laws to six more states resulted in the defeat of such laws in five of the six states, but it had no effect on the North Carolina law. In 1965 organized labor again tried to get Congress to repeal Taft-Hartley section 14(b), but there was no change in North Carolina. Since then, state and national campaigns to repeal right-to-work legislation have declined sharply, and the number of states with these laws has stabilized. By the early 2000s there were 20 southern and western states with such legislation. Olson, Elizabeth G. "What right-to-work laws really mean." Fortune. January 31, 2012. http://management.fortune.cnn.com/2012/01/31/what-right-to-work-laws-really-mean/ (accessed October 12, 2012). Oral History Interview with William W. Finlator, April 19, 1985. Interview C-0007. Southern Oral History Program Collection (#4007) in the Southern Oral History Program Collection, Southern Historical Collection, Wilson Library, University of North Carolina at Chapel Hill. http://docsouth.unc.edu/sohp/C-0007/excerpts/excerpt_4050.html (accessed October 12, 2012). Graham, David A. "Unions Prepare for a Bittersweet Labor Day in Charlotte and Nationwide." The Atlantic. Sept. 3, 2012. http://www.theatlantic.com/politics/archive/2012/09/unions-prepare-for-a-bittersweet-labor-day-in-charlotte-and-nationwide/261877/ (accessed October 12, 2012). 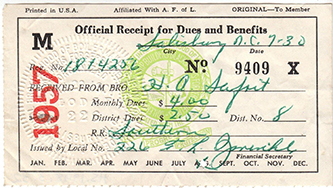 "Receipt, Accession #: S.HS.1998.3.32." 1957. North Carolina Historic Sites.